Here we share a direct link to Download ZenFone 4 Max WW-14.2016.1711.215 Firmware Update. The update brings ZenUI 4.0 to Zenfone 4 Max along with VoLTE and enhanced double-tap gesture settings. 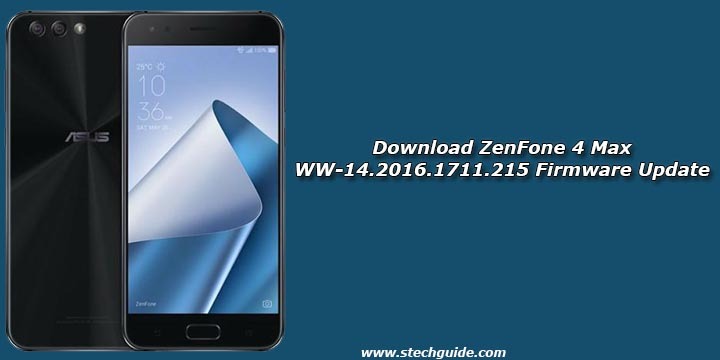 Download ZenFone 4 Max WW-14.2016.1711.215 from below. The v14.2016.1711.215 update for Zenfone 4 Max is an Incremental update which rolls out in phase wise manner. The update is rolling out via OTA (over-the-air) and many users already getting the update. You can wait for the OTA updates, or you can Download ZenFone 4 Max v14.2016.1711.215 OTA to update it manually with below method. Download Asus ZenFone 4 Max WW-14.2016.1711.215 firmware update file from below. We provide you the Asus Zenfone 4 Max WW-14.2016.1711.215 OTA zip which you can flash on your device. You can check for the by go to Settings > About > System Update > and check for update. So if you want to update your Asus Zenfone 4 Max to the latest version then Download Asus ZenFone 4 Max build 14.2016.1711.215 from below. This method is only for the ASUS ZenFone 4 Max (ZC554KL) For WW SKU only. 4) Download the WW-14.2016.1711.215 OTA Zip file for Asus Zenfone 4 Max from above Copy ROM to ADB folder.